December 12, 2008 marks the 60th year of one of the greatest films ever to have been made in the world. A film that spawned a whole generation of filmmakers and influenced the art of cinema as no other film did. 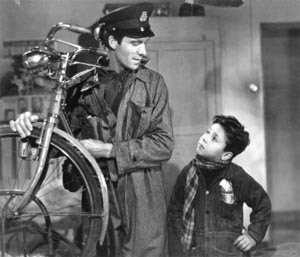 In December 1949 when Bicycle Thief was to be released in America it ran into problems with Production Code Administration that supervised American releases for being refused an approval owing to one scene in a brothel that allegedly seemed irreverent and another in which a boy urinates. But Vittorio De Sica, the director, did not budge and eventually got the film released. At home too, film saw a dismal release in November 1948, a year ago, when Italian audience did not evince any keenness to embrace a movie depicting hunger, poverty and post war realities with an unfamiliar non professional cast. Notwithstanding these initial hiccups since then film not only went on to win the academy award for best foreign language film of 1949 (two years ago it was De Sica's Shoeshine that had stunned the heads of intellectuals of art of cinema and hence began a tradition to reward a film in a language other than English.) but also almost every other coveted award that exists in firmament of cinema along with top ranks in all hallowed cine critic's list of greatest movies. When I sat down to watch Bicycle Thief for the first time (a downloaded version without subtitles, later I saw it many times over with subtitles and love affair continues) I had certain apprehensions in regard with alienation of a non comprehensible language. But to my utter relief it did not take more than five minutes for my apprehension to get washed away. Within few minutes of beginning of rolling it down, I was enjoying the sight of post war Rome devoid of its typical monuments but inundated by war ravaged decrepit walls and buildings. I couldn't understand even a single sentence said in the film but yet not even a single uttering came in the way of movie endearing itself to me. Perhaps, plethora of information I had had (mostly positive, to the extent of provocating a viewing) about the movie may have influenced my reaction to the film and got translated into fervent admiration but on the flip side often pre-conceived notions have their own limitations. What if movie had not been able to reach high pedestal I had put it on owing to reading accounts of gargantuan praise lavished on the movie across world. Movie not only stirred away every pore of my nerve but made me feel being in the midst of Ricci and Bruno as someone who can follow them, watch them, partake their sorrow and share their joy but can't help them. A film that catches breath and ties them with every image that springs up on screen. A film that doesn't hold our attention but make us loll along with the father son duo in their quest for their bicycle and hence any left over signs of development on the index of humanity in the post war Italy. A film that caters to the intellectual stimulation and satiation of intelligentsia in equal measure to that of curiosity level and sense pleasing of an average cinegoer or movie buff. An almost story-less film, without having a solid foundation of conventional elements interspersed in, carries the audience with utter fairness along its pace through 93 minutes of its play. A frantic search for a bicycle without much twists and turns sans any suggestion about the possible recovery of bicycle is what all that forms the narrative of this film that is called Bicycle Thief. Once Satyajit Ray, while emphasizing the importance of visuals over words in a piece of cinematic work, had spoken about the image as a potent career of words rather than words themselves since cinema is primarily a visual medium. Bicycle Thief stands true to this definition of cinema. You don't need to know language in order to be able to identify the film. Great cinema doesn't let the language become an impediment in its march towards a universal appeal and impact and Bicycle Thief does it with aplomb. That said knowledge of language or availability of subtitles will definitely help in bestowing more clarity. Once I entreated my mother (an erudite housewife) and brother (a 10 the class student) to see the movie at sometime around 9 pm (time for retiring to bed for my mother) in the night. To my utter astonishment and great gladness not only both enjoyed the movie but couldn't resist themselves from dipping into a discussion about it. And so did one of my colleagues when he wished to see the film. He took leave of me utterly satisfied after having a tryst with a new kind of cinema, he had never encountered before. I have cited these two examples to back this movie's universal appeal. This is the cinema that is more in motherly embrace of poetry than prose, that celebrate images rather than grotesque visuals, that respects music for its sensibility and balmily coupled with sprinkling of haunt-ness rather than hoodwinking it by using it the way a pimp uses whore to further his pot bellied greed and lust. As the very first bars of a music (by Alessandro Cicognini) strikes our ear drum, it sets the tone for entire movie to get unfold the way a poem hurls the combination of words to represent metaphors that carries within them meanings and interpretations ready to be molded. And for the next ninety three minutes we are transported into a world whose images devour the distance between viewer and protagonists to endow the movie the indelible label of an everlasting classic. As we see the weary face of Ricci on the screen, we are convinced of his being a vulnerable entity. The ripped and filthy clothes, he is attired in, further buttresses our nascent but firm belief. Through the ordeals and travails of Ricci we also get to know and see the travails of post war Italians (especially those who are from the same stratum as Ricci is) and post war Rome, trying to emerge from the shadows of a cataclysmic war. Employment opportunities are too scant thereby a grabbing anyhow is worth life seized. Ricci tries for a job and he turns out lucky to be summoned. He is happy and ecstatic for a second before getting grim when he is told about the possession of a bicycle to be necessary in order to be able to grab job. He is given time to arrange for a bicycle. The times after war are gloomy despite effort to build the nation again. A job equals life and life becomes worth living through a job only, a truth relevant till this day. Ricci's wife mortgages their wedding gift of a pair of bed sheets in lieu of some money that helps in bringing previously pawned bicycle back home. The repetition of pawning stands testimony to the dire times. Ricci's son, Bruno, only 8 year of age but much more grown up and mature for his age (being mature at raw age is good or bad for child himself is an incisive question) is already employed with a diesel pump. The new found job and hence new found spirit to live life creeps into Ricci's home and with smiling visages and blithe greetings father son duo set off to their respective work places mounted on their new possession and riding on new found hope to live life. Ricci drops his son at diesel pump before reaching his destination. Day wears on. Bruno waits for his father to come and take him home on their bicycle but the wait stretches further and further before father approaches Bruno stealthily from behind. No bicycle in sight, only utter deflated face of father is what Bruno gets to see. Father has no answer to Bruno's curious eyes, pale face and some word teetering lips. He just beckons him to start walking and father son duo with their gloomy visages and palpitating heart set out to home along the dusty embankments of Tiber river. A day that had begun at happy visages ends in gloomy shadows. No bicycle, no job, no job, no life. No life no living: as simple as that. Ricci had already been snubbed by post war insensate Rome police when he had gone there with his plea to help him recover his stolen bicycle and hence a reason to live. He doesn't have the heart to walk into home, empty handed but ironically with loads of moroseness scattered around his face. He thinks it prudent to seek some friend's help to scour the life again, to search for bicycle, again: a poor man's desperate wish to live. Next day is Sunday: a long and crucial Sunday of frenzied search for bicycle by father son duo. Why Ricci is not alone? Why he is dragging Bruno with him. May be poor man is not that poor as he perceives himself. A mature working son is the only solace in lieu of bicycle that he so desperately needs to soothe his longed solace. A wandering around Rome, not the Rome that outside world knows, but a Rome that Ricci and millions like him know, with bomb ravaged buildings, charred gates and decayed walls. Mooching about through streets, markets, tolerance house and even a restaurant with a shower of rain to force them take a breath and walk on even more slippery paths than they actually are, finally Ricci is able to nab the crook. Father son duo, in the throes of pathos and poverty do present before us an indefatigable spirit to discover life once again from amongst the rubble of dashed but not dead hopes and the inextinguishable power, that human beings are able to draw from one another. Ricci and Bruno are searching for their chance of life in the form of bicycle trudging through the cobbled and oozed streets of Rome in utter state of being cadaverous but the moment they realize they are two, they are with each other, a flow of life from one to another serves as an immense power in allaying and to some extent even livening up the moribund hope lying on their faces. In these utter moments of despair, a flirtatious chuckle doesn't escape their lips. In the light of the fact that Ricci and Bruno have a crucial job at their hand, they achieve a tour de force when they find themselves in a restaurant munching on some dishes and savoring the music. The contrast with which the image of Bruno stretching a helping while looking at a rich girl having her morsel is juxtaposed with merriment of rich family, drives home the poetry of pathos, the triumph of humanity and chasms deep in the vein of society. A chasm that gets deeper as we age. The return of gloom on Ricci's visage after forgetting for a while the hard reality of life completes the poem where metaphors not only decide the range of poem but also the sorcery of paradoxes. There is another scene in the movie which depicts so poetically the irreverence of humanity towards softness. A colleague of Ricci, busy posting posters on wall mauls a barefoot child mendicant when he walks past him playing a musical instrument. As he gets hit the melody of music too gets disturbed. Here the man is not mauling just a child but also disturbing or disfiguring what could have been a lilting melody. How can the melody be heard much less played in the times contrary to rhythms of life. The poetry of images like vehemence defense of thief by her almost harridan mother, Bruno sending for policeman at sensing trouble for his father, thief taking refuge into a brothel, roars emanating from a football ground, striking up of Ricci's shoulder with moving vehicle, creeping in of restrained sentimentality in climax and many more such moments uplift the movie from being just a simple collate of visuals to world of images wanting to be seen and deserving to be seen time and again. We are made completely assured of decency of our protagonist when we see him (in the bicycle theft scene), after having failed to nab the thief, getting back to his work and trying finish the leftover work in acute distraught. Our perception of Ricci doesn't take a hit even when we see this simpleton trying to be, though bludgeoned by indifferent circumstances, what is contrary to his nature. We feel bad when Ricci, the hero for his son gets thrashed before the eyes of son before dissolving into the crowd. The trenchant question is never answered. We are left in the belief that now Ricci is part of the crowd and dictates of crowd will shape his life hence after not his own frantic search to discover life. Decency of Ricci couldn't make him worthy enough to be able to provide us with answers before taking to disappearance. We can't have more apt symbolical representation of times of post war Italy playing games with innocent lives. The urgency of job at the hands of a father gets reflected in an another landmark scene when in the midst of frantic search for bicycle Bruno tries to relieve himself and even before he begins, a loud shout of father makes him abandon answer the call of nature. Then we see Bruno shadowing the father again. We have no idea whether he got another opportunity to relieve himself or not. A spirited work of Neo-realism, that vicariously launched the career of as stalwart a filmmaker as Satyajit Ray (Ray once admitted that it was the viewing of Bicycle thief in Britain that precipitated his desire to become filmmaker), that entrenched and firmed the foundations of a new wave started by the likes of Visconti and Rossellini and that set the theory into motion that actors can be dispensable commodity with even more greater force. De Sica preferred a factory worker to play the character of Ricci to legendry Cary Grant and made him work like an accomplished actor. Not for once the lead actor, Lamberto Maggiorani, who had no knowledge or experience of acting prior to working in this film, did show any signs of nervousness before the camera. So did the child actor, Enzo Staiola. This too is one difference that sets it apart from other neo realist movies where amateur actors do give a sense of their not being perfect. No doubt Vittorio De Sica's immense experience of having been an actor had helped him profoundly. His habit of enacting almost every scene for the actor made the task for actors somewhat easier and hence the groundbreaking film with unforgettable and indelible charisma. When we talk about De Sica, the actor's contribution to De Sica, the director, we should not forget that his first four films as a director were normal movies in the tradition of the then run of the mill Italian cinema. There was nothing to write home about them. Even that insignificance characteristic of cinema stood him in good stead when he filmed Bicycle Thief. The scene set in house of tolerance where men pursuing the Ricci and Bruno kneels each time they pass the pulpit engineers a light chuckle on viewer's visage. Then we have that restaurant scene where Bruno though immensely mature indulges in a transient childlike activity. Viewer is relieved to see a child in a child. These scenes bring a lightened texture to an otherwise gloomy film. 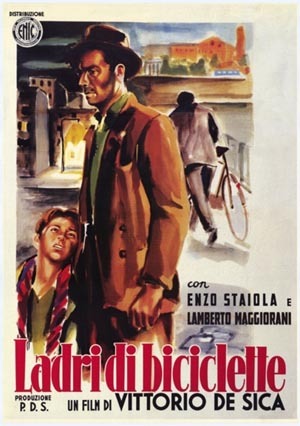 Loosely based on a novel by Luigi Bartolini, whose script was written by Cesare Zavattini, (the arrival of whom started a dream run of De Sica: beginning from the The Children Are Watching Us, both went on to do many films together) Bicycle Thief represents a world where the famous adage 'survival of the fittest' propounded by Charles Darwin gets lived and breathed. Bicycle Thief shows us a world where, to be able to survive one needs to have incessant courage. In terms of its cinematic adoption the story transcends the simplicity of a story, the location of a city, the poverty of a particular stratum and represents for us a world where we have to fend for ourselves irrespective of who we are and where we are. As we see father son duo being lost in the crowd we also see a compendium of images savored by our eyes for last one and half hour being hanged on a rope of universality of emotions to see them being drenched by rain of pathos of yearnings and then being dried to a resplendent sight by sunlight of borderless humanity.